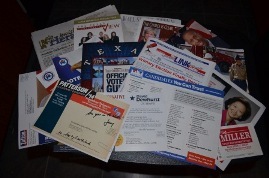 During the runup to the Texas Republican Primary last month, we all received tons of mail soliticing our votes. Some of these were campaign materials from candidates. Of those, some were postitive about the candidate and some were very negative attacks on their opponent. There were also mailers from what politicos call "The Slates". The Slates are the many various groups or individuals who evaluate candidates and make an endorsement of a slate of candidates. I wrote an article about these slate mailers last month asking the question about which ones of these can be trusted. I also spoke with many candidates about the slates and how they were treated by the organizations or people who put them together and the impact they had on their campaign (positive or negative). Harris County Precinct 4 Constable, Ron Hickman, promised me a response to my questions after the campaign was over. I had also talked with him about some particularly nasty negative campaign tactics which were being used against him. Following is an article he wrote in response to my questions. With the recent primary elections behind us, I wanted to provide some perspective to these issues from a candidate’s point of view. Most candidates would eagerly covet endorsements and more so those whose recommendations are both prominent and published. I've seen various articles both this cycle and in years past that proclaim some such endorsement lists, or "slates", as pay for play, as they are recently being called. A recent comparison published in a Chronicle article did a side by side comparison of several such slate lists from the more prominent ones in our area. It looked at the endorsements and which ones endorsed which candidates. I've seen other such past comparisons that matched advertisements paid for by the candidates and their amounts against the actual endorsements as well. It's easy to draw conclusions about whether its fair, proper, or even ethical for candidates to participate. As much as we all would like a system that is free from the appearance of impropriety, let's face it, a candidate has several choices about how to broadcast and market their message. Many people in the area look to and respect the endorsements of specific groups or individuals and an advertisement is cheap by comparison if it helps pay to get your name in front of voters. For example, my routine voter list will cost more than $23,000 to mail just one time and an advertisement that costs $5,000 or even a donation of $10,000 for help pay for mailing such lists is surely more cost effective. Most serious and active candidates would want to mail more than once so those costs can mount up quickly. That issue is exacerbated for those running in county wide and legislative races by sheer volume. Ergo all the more pressure to get yourself aligned with people who widely distribute the most common lists carried into the polls. Until we find a way to level the playing field, those who feel their influence is respectable, notable, or even worth paying for, will continue to put their opinions and recommendations of candidates in front of voters wherever they can and usually any way they can. It may be time to consider some way to put a buffer period between when endorsements are made and when candidates can contribute or pay for advertisements. At least this small step would help avoid the appearance of impropriety, or "pay to play" claims for candidates and establish more credibility for such lists with voters. Each election cycle there seems to be a candidate or two that feels that attacking personal character or even family members publicly is the way to go. Personal attacks and dirty tricks seem to be the theme of the day when it comes to politics these days. From large scale races on a national level to local races, smear tactics and direct personal attacks seem to some as the best campaign strategy. For campaigns that are light on a candidate with real qualifications or candidates who are light on experience for the job, it's easy to look for some weakness or flaw in their opponent they can exploit in the most public way possible. Many of us have seen campaign commercials like the recent campaign adds declaring opponents to be "empty suits" or basically saying opponents were not men of substance. Capitalizing on the chink in their armor is risky and at an ever increasing rate, voters seem to be reacting negatively to such negative campaigning. It’s hard to separate such releases from being distributed from a particular camp and the fallout from leaking it can have unintended consequences. In this age of social media with Facebook pages, Internet websites, and Twitter, it has become easier than ever to put some piece of information into the political ether in the hopes of destroying your opponent’s credibility or character. All of this can be done with little to no accountability. Politics is the one arena where little can be done to successfully defend yourself. It’s a sleazy business on an average day, but we’re reaching new heights it seems. There was an article from an Austin paper recently about a candidate for Constable that put up a website calling the incumbent "The Cocaine Constable" and a lawsuit has now ensued in an attempt to cease its operation. In the meantime, neither garnered enough votes to avoid a runoff. It is likely to be as interesting as the primary. Its one thing to point out performance failures and other shortcomings of an incumbent or opponent but in most cases, the voters are going to expect a viable alternative, not just another unqualified name on the ballot. A sense of decorum and common decency in politics seems to be diminishing with almost every election cycle. I've had politician friends who have been the victim of just such negative pieces and I've had my fair share. I started my political career in 1999 with one thought in mind, if the best thing you can say about yourself as a candidate is something bad about your opponent, you're losing already. 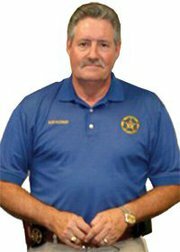 Constable Ron Hickman leads our nation's largest constable department. He has been serving the people of Harris County since his election in November, 2000. He has been a leader in the implementation of many law enforcement technology advancements and has been aggressive in his attacks on online child predators and human trafficking. He was recently re-elected in the Primary Election with over 85% of the vote in a five person race. What good ole' boy Ronnie ain't saying is that the negative campaigning is a major form of enlightenment to the voters on the prospective candidate(s). There this diminishing thing we call "exposing the truth". Some of the facts that I know personally is that Ronnie called the head of a Police agency 3 times to complain about the perfectly legal campaign tactics of a certain candidate and used his on-duty political goon squad to remove campaign signs and threaten some of the persons that were placing them out in LEGAL locations. He obviously wanted the prime spots first! The paid endorsement fancy flashy sample ballots that come to selected voters are just IDIOT guides for the average busy household to hurry them through the process/line reduction and call it "their civic duty" done! GOOD MONGO, GOOD! We all know that to avoid civil suits of slander, we are to publish only the factual truth! Any "negative" comments about Ronnie were fact based but rarely published. Such sites as Ronhickman.info. FACTUAL and still in the making. There are more moral and ethical candidates if voters would research and not be lead by false profits.